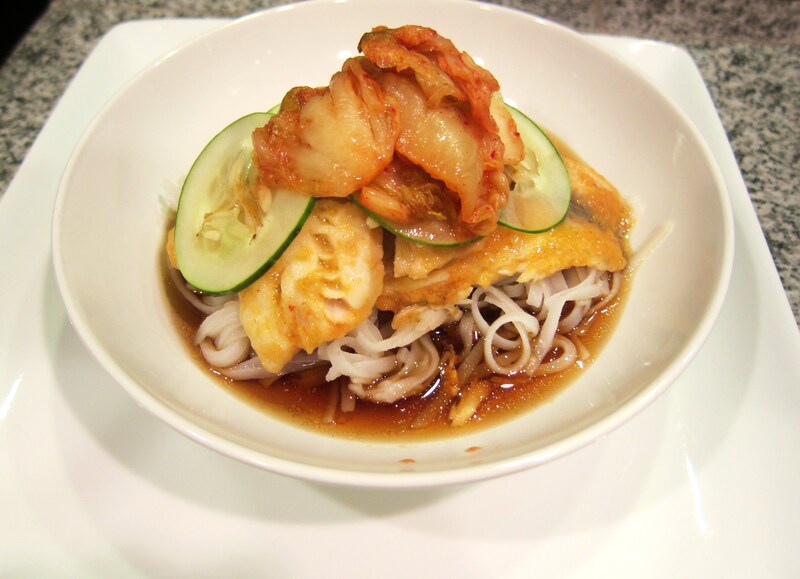 Kimchi-Cured Tilapia with Quick Pickles – Top Chef Masters Night | Eat.Drink.Life.Love. The freshest fish I’ve ever experienced was John Dory at a restaurant called Out of the Blue in Dingle, Ireland. The restaurant is located right on the docks — the fish comes off the boat and goes straight into the kitchen. If there’s no fish that day, the restaurant is closed. Oh, the tales I could tell about my adventures driving around Ireland, but that fish…oh, that amazing fish. But we live in Minnesota faaaaaarrrrrr away from the ocean and it’s very difficult to find John Dory here. So when Chef Doug Keane cured John Dory in kimchi, we knew we couldn’t replicate the deliciousness, but we could create a delectable version of the dish. We marinated our tilapia (an acceptable substitution for John Dory, according to my Internet search) in kimchi for a few hours. Simmered it until just cooked through (because I didn’t trust just the curing method for our previously frozen fish), made a simple dashi broth and served it over rice noodles. Simple. Gorgeous, light but filling, tangy, sweet, delicately meaty with hints of spice and deep broth. If you’re looking for a quick gourmet meal, you’ve found it. To make the pickles: Mix ingredients, adjusting sweet, tart, salty and spicy to taste. 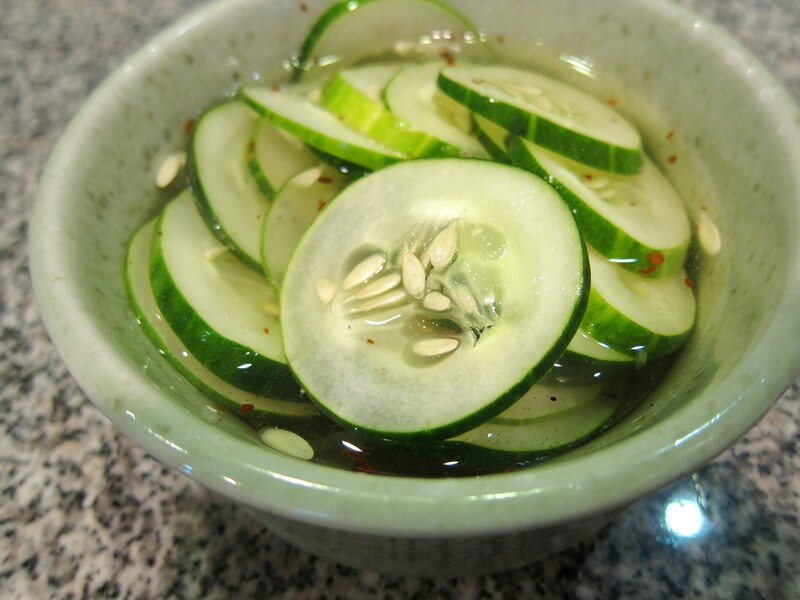 Add the sliced cucumbers and let sit for at least 30 minutes (can be made up to five days in advance and kept tightly covered in the refrigerator). To make the fish: Mix the kimchi and lime juice in a large container, add fish and make sure it’s coated and covered with the mixture. 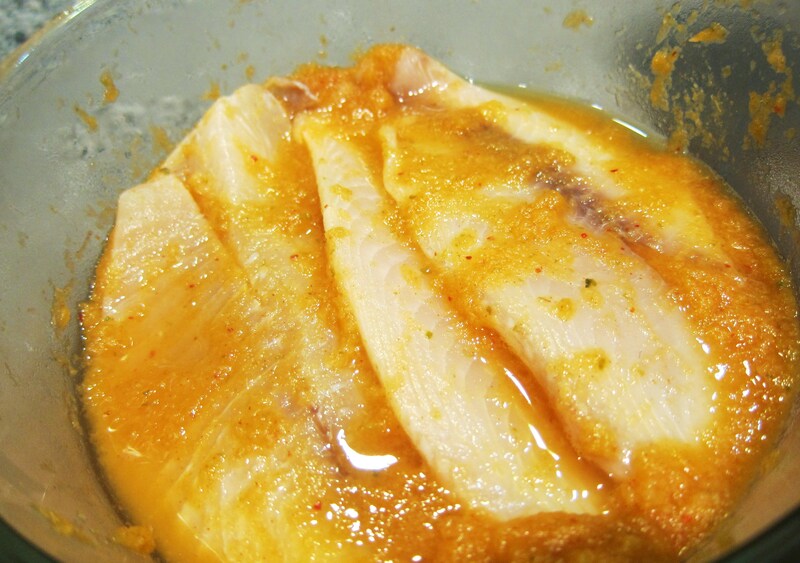 Cover and let marinate in refrigerator for at least two hours. *Thaw fish first, if it’s frozen. Add marinade to hot saute pan. When simmering, add fish and cook until it’s just opaque white and flaky. To make dashi: Rinse kombu then soak it and dried mushrooms in warm water for 5 minutes. Bring your pot of water to a simmer (just below a full boil). Slice mushrooms then add them and kombu to simmering water. Cook for 15 minutes. Remove the kombu and mushrooms then add soy and onions (if using). Mound your noodles in a bowl, add the broth over the noodles. Place the fish on top, add pickles and pile on some kimchi for garnish. Enjoy. Glad you are making your own dashi 🙂 This looks like an interesting recipe to experiment with — good combination of flavors.